Championed by Chamber Music Magazine as “Saxophone Ambassadors”, the Mana Quartet has, since its inception in 2007, presented fresh interpretations of 21st-century repertoire and many virtually unheard of 20th-century masterworks. Using vintage instruments built to the specifications of the saxophone’s inventor, Adolphe Sax, Mana’s passionate presentations offer audiences a chance to view the saxophone in a new light – a striking aesthetic characterized by intrinsic warmth, dynamic range of character, and absolute versatility. 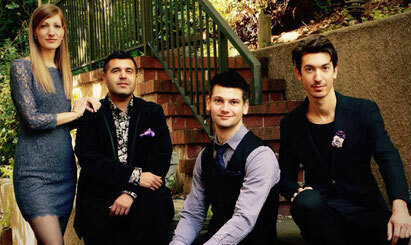 Mana redefines the saxophone quartet and the saxophone’s place in classical music. In 2009, the group became the first saxophone quartet in history to receive the coveted Grand Prize at the Coleman International Chamber Ensemble Competition, quickly elevating them to the professional chamber music arena. Since then, the group has taken on a growing list of residencies at major music festivals and universities, as well as countless community outreach concerts and events throughout the United States and Europe. Mana is repeatedly featured on NPR’s Performance Today, with orchestras across North America in featured concerto appearances, and maintains a high profile on the chamber circuit. Mana is currently the Resident Chamber Ensemble at the National Music Festival, where they recently performed Philip Glass’s Concerto for Saxophone Quartet with the festival orchestra and hosted their 5th annual Mana Saxophone Institute, an internationally attended two-week intensive apprenticeship program. 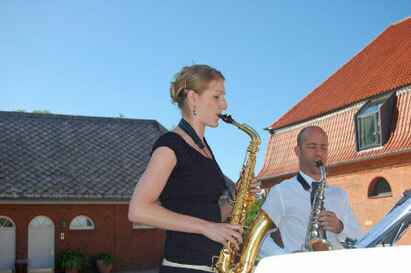 The German word Klang refers to sound and hints at the unique quality and enormous range of tone colors (klangfarben) inherent in the saxophone. Par2 is a reference to the ubiquitous presence of the saxophone in world culture. It also suggests a pair of instruments and artists on equal footing, while making a subtle nod to the parabolic design of the inventor Adolphe Sax (1814-1894). KLANG PAR2 is committed to the expansion of dynamic new works for two saxophones as well as rediscovering and rendering music from the past. With its kaleidoscopic variety of tone colors and sound effects, the saxophone is a perfect vehicle for modern music. And with its vocal quality, clarity of articulation and surprising tenderness, the saxophone is equally suited to old works. Indeed it brings a refreshing and unique sound to music of the masters from earlier centuries. KLANG PAR2 (Wildy Zumwalt and Diane Hunger) performs exclusively on vintage Buescher saxophones from the 1930s modeled after the original design of the inventor. These instruments retain the parabolic design created by Sax which is an essential element in giving the duo its flexibility and wide array of tone colors.